Nestled in the blue lagoon on the French Polynesian island of Bora Bora, Conrad Bora Bora Nui is a luxurious South Pacific hideaway. Surrounded by lush tropical landscapes of white sandy beaches, colorful coral gardens, crystal clear waters and swaying palms, the resort is an idyllic haven of tranquility with luxurious facilities, gourmet restaurants, an exclusive spa and the private Motu Tapu islet. The resort features 122 suites and villas with spectacular views of the ocean, hills or gardens, five world-class restaurants serving a variety of cuisine, a 1,000 square meter infinity pool overlooking the lagoon, a 24-hour fitness center and an exclusive spa and wellness center. A range of beautiful venues cater for business functions, social events and weddings and the private islet of Motu Tapu, once home to Polynesian Queen Pomare IV's private beach, is ideal for intimate lunches and romantic dinners. 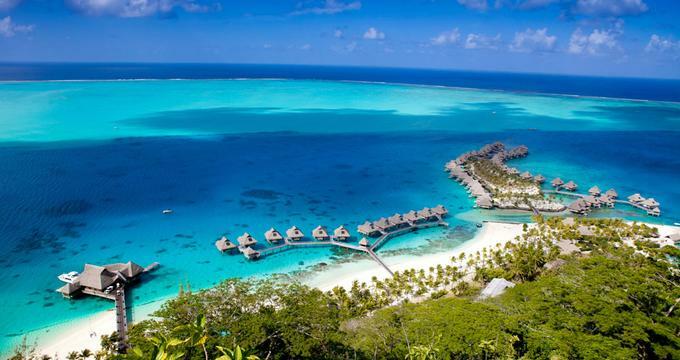 Home to verdant hills, ivory sand beaches, coral gardens and extinct volcanos, Bora Bora is a magical destination for water sports such as snorkeling, scuba diving, swimming, kayaking, jet skiing or just relaxing on the exquisite beaches. Guest room and suites at the Conrad Bora Bora Nui are designed for absolute comfort and convenience with contemporary décor, modern amenities and lovely views. All accommodations feature facilities such as en suite bathrooms with separate showers, baths and bidets, dining areas with tables and chairs, living areas with comfortable pull-out sofa beds, entertainment centers and workstations. Standard amenities include air-conditioning, electronic smoke detectors, LCD flat screen televisions with on-demand movies and video games, DVD/CD players, alarm radios, in-room safes, minibars, iron/ironing boards and a 24-hour housekeeping service. Complimentary high-speed wireless Internet is available throughout the resort. King Garden Guest Rooms are 1,076 square feet in size and feature king size canopy beds with imported linens, en suite marble bathrooms with separate bathtubs and showers and separate living areas with comfortable sofas, work desks and LCD flat screen televisions with on-demand movies and video games. These rooms have private terraces that offer stunning views of the surrounding tropical landscapes and gardens. Twin Lagoon View Suites are 1,076 square feet in size and feature twin beds in imported linens, en suite marble bathrooms with separate bathtubs and showers and separate living areas with comfortable sofas, work desks and LCD flat screen televisions with on-demand movies and video games. 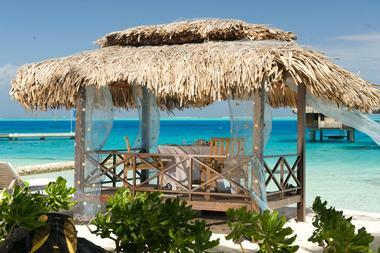 These rooms have private balconies that offer lovely views of the lagoon. Twin Overwater Villas and Twin Deluxe Overwater Villas boast breathtaking views of the bay from glass-paneled waterside balconies. These 1,022 square foot villas feature spacious bedrooms with twin beds in imported linens and en suite Italian marble bathrooms with separate bathtubs and showers. Living areas offer comfortable sofas, work desks and LCD flat screen televisions with on-demand movies and video games, and open out onto private balconies with beautiful lagoon views. Nestled in the lush coconut garden, independent King Garden Villas are 969 square feet in size and feature exotic Polynesian-inspired décor and rich mahogany furnishings. These grand villas offer king size canopy beds in imported linens, en suite marble bathrooms with separate bathtubs and showers and separate living areas with comfortable sofas, work desks and LCD flat screen televisions with on-demand movies and video games. Private terraces embrace lush garden views. King Lagoon View Suites are 1,076 square feet in size and feature king size canopy beds in imported linens, en suite marble bathrooms with separate bathtubs and showers and separate living areas with comfortable sofas, work desks and LCD flat screen televisions with on-demand movies and video games. These rooms have private terraces that offer stunning views of the lagoon. Standard amenities include air-conditioning, electronic smoke detectors, LCD flat screen televisions with on-demand movies and video games, DVD/CD players, alarm radios, in-room safes, minibars, iron/ironing boards and a 24-hour housekeeping service. King Overwater Villas and King Deluxe Overwater Villas boast breathtaking views of the lagoon from glass-paneled waterside balconies. These 1,022 square foot villas feature spacious bedrooms with king size canopy beds with imported linens and en suite Italian marble bathrooms with separate bathtubs and showers. Living areas offer comfortable sofas, work desks and LCD flat screen televisions with on-demand movies and video games, and open out onto private glass-paneled balconies that highlight Bora Bora’s exotic marine life below. King Panoramic Hillside Villas are tucked away on the hillside around the resort and offer beautiful views of the lagoon, as well as spectacular sunsets. The 969 square foot villas feature spacious bedrooms with king size canopy beds with imported linens and en suite Italian marble bathrooms with separate bathtubs and showers. Living areas offer comfortable sofas, work desks and LCD flat screen televisions with on-demand movies and video games. 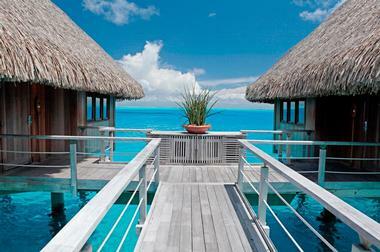 King Royal Overwater Villas are studies in luxury and elegance. These 1,453 square foot villas feature spacious bedrooms with king size canopy beds with imported linens and en suite Italian marble bathrooms with separate bathtubs and showers. Living areas offer comfortable sofas, work desks and LCD flat screen televisions with on-demand movies and video games, and open out onto a private deck with whirlpool tub and glass paneled terrace that highlight Bora Bora’s exotic marine life below. Newly refurbished Sunset Pool Overwater Villas are 1,184 square foot in size and feature spacious bedrooms with king size canopy beds with imported linens and en suite Italian marble bathrooms with separate bathtubs and showers. Living areas offer comfortable sofas, work desks and LCD flat screen televisions with on-demand movies and video games, and the villa’s bathroom has a glass panel that highlights Bora Bora’s exotic marine life below. Standard amenities include air-conditioning, electronic smoke detectors, LCD flat screen televisions with on-demand movies and video games, DVD/CD players, alarm radios, in-room safes, minibars, iron/ironing boards and a 24-hour housekeeping service. The Presidential Overwater Villa takes luxury to new heights with spacious living, dining and sleeping areas spread over two levels, a private swimming pool, sundeck and whirlpool and private sauna. Two bedrooms feature king size canopy beds are dressed in imported linens, two dressing rooms and two stunning Italian marble en suite bathrooms offer glass-enclosed showers and separate bathtubs. A third bathroom is available for guests. 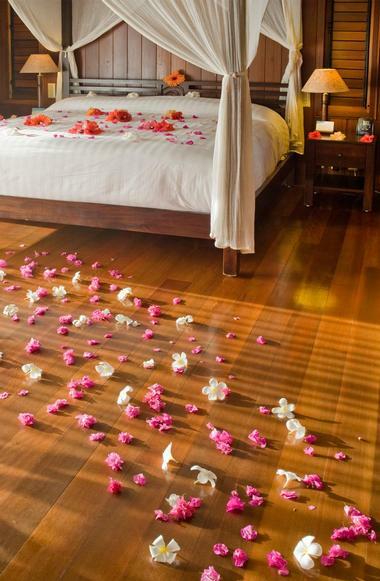 The upper floor of the villa features a wellness room with massage room and sauna, as well as a private sundeck with bar area and day beds while the lower level is home to a sundeck, private swimming pool and whirlpool against a backdrop of breathtaking views. Conrad Bora Bora Nui offers five dining establishments where guests can enjoy a range of local and international cuisine, signature cocktails and fine wines. Catch the sunset at Upa Upa Bar over handcrafted cocktails, before heading to Iriatai restaurant for mouthwatering Polynesian or Mediterranean fare. Savor an intimate feet-in-the-sand dinner for two at the Tamure Grill or tuck into a light lunch at the poolside Ta le le Bar. Boasting stunning views of the lagoon, Iriatai (meaning 'on the surface of the water’) serves an exotic menu of Polynesian and Mediterranean specialties accompanied by fine wines and colorful cocktails. Iriatai also presents a delicious breakfast buffet of freshly baked pastries, fresh fruit and local salads. Boasting traditional French Polynesian design, the Ta le le Beach Bar is a relaxed, laid-back lounge bar located between the beach and the pool that offers a tempting range of snacks and exotic cocktails in a gorgeous beach setting. Friday evenings serve Japanese tapas and host live jazz music. Nestled between the sparkling swimming pool and the stunning white sandy beach, the Tamure Grill is perfect for an intimate feet-in-the-sand dinner of freshly caught seafood, juicy steaks and freshly prepared salads and vegetables. A traditional Polynesian buffet and dance show is held every Tuesday evening. The intimate Upa Upa Restaurant & Bar is an elegant lounge bar with eclectic Polynesian décor that serves a delectable range of appetizers, snacks and traditional Polynesian dishes. Perfect for an intimate dinner for two or casual drink, Upa Upa is a great place to catch the beautiful sunsets over the Pacific Ocean. The resort's private islet Motu Tapu offers the ultimate South Sea dining experience where guests can dine on the private beach of Queen Pomare IV. Perched high on the hilltop overlooking the resort, the luxurious Hina Spa at Hilton Bora Bora Nui Resort offers a haven of tranquility in the heart of a lush tropical oasis. The Spa features elegant relaxation lounges, beautifully appointed treatment rooms with stunning views of the lagoon, three double treatment bungalows with private whirlpool baths, aromatherapy whirlpools, steam rooms and a sauna. Spa treatments range from massage therapies, body scrubs and treatments, facials, wraps and skin care, each of which is designed to promote total relaxation and rejuvenation. Indulge in the Spa’s signature Million Dollar View Experience, which includes a therapeutic foot bath and body polish, followed by an intuitive Maohi Nui massage in an open air bungalow overlooking the lagoon. Conrad Bora Bora Nui offers elegant venues for meetings, social events and functions, ranging from the 1,500 square foot Function room that can accommodate up to 80 seated guests to the Tamure Grill, which can be used for exclusive-use evenings of up to 200 persons. The Resort also offers special wedding packages that include venues such as the private beach, the tiny chapel overlooking the lagoon or the private island of Motu Tapu. Conrad Bora Bora Nui offers an array of facilities, amenities and services for guest comfort and convenience, including a 24-hour fitness center, 24-hour business center with meeting rooms, complimentary photocopying and printing service and fax machine, babysitting services, children’s video rentals and cribs on request. Other services include baggage storage, clothing store, a concierge desk, foreign currency exchange, laundry/valet service, guest activity/recreation desk, luggage hold and room service. 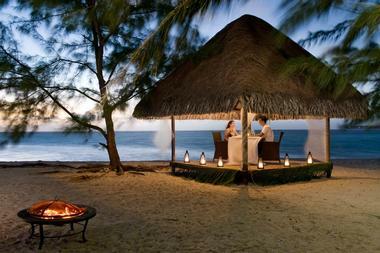 Back to: Secluded Romantic Getaways and Most Unreal Resort Pools.